These are 2017 and 2018 Christmas Collection Sets! 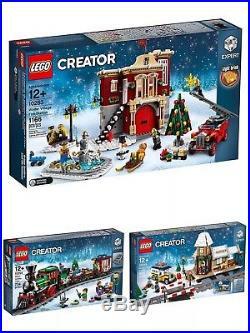 Build the Exclusive Fire Station (10263) and add the Winter Holiday Train (10254) and the Winter Village Station (10259). Complete the Winter Village with these wonderful sets! 10254 : Winter Holiday Train Set. Gather the family for some festive LEGO® building fun with this charming model featuring a full circle of track, boarding platform with bench and lamppost, a Power Functions upgradable train engine with brick-built smoke bellowing from its stack, coal tender, flatbed wagon with a rotating holiday tree, toys and gifts, and a red caboose with a detailed interior and table. The train engine also features large and small red-colored locomotive wheels and the train is decorated with green wreathes, string lights and white tree elements. This LEGO® Creator Expert set includes 5 minifigures. Instructions can be found in the back of your building instructions. Build a Winter Holiday Train with a full circle track and a decorated tree that spins as the train moves. 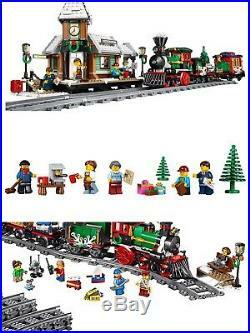 Includes 5 minifigures; a locomotive driver, ticket collector, grandmother, boy and a girl, plus festive green wreaths, decorative lights, and buildable micro toys for minifigures. The holiday train in total measures over 4 high, 20 long and 2 wide. 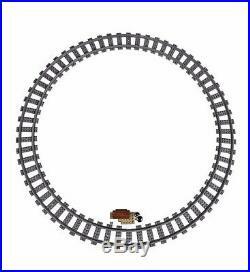 Curved rail track diameter measures over 27. LEGO Creator building toys are compatible with all LEGO construction sets for creative building. 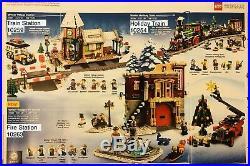 10259 : Winter Village Station Set. Head for home with the festive Winter Village Station holiday set, featuring a snowy railroad station with wreath adorned lampposts and clock tower, platform, mailbox, green trees, snowy grade crossing with twin barriers and lights, and a beautiful, festively decorated bus with opening doors and a luggage rack with removable luggage and gift wrapped packages. Includes 5 minifigures: a bus driver, barista, grandmother, child and a ticket agent. The festively adorned Winter Village Station features a snowy train station with a clock tower, platform, coffee shop, ticket counter, grade crossing with twin barriers and lights, lampposts, mailbox and green trees, plus a bus. Coffee shop features a serving hatch and a detailed interior with espresso machine, cups, cash register and a menu. Bus features festive decoration, opening doors, luggage rack with removable luggage and gift wrapped packages, and a removable roof for accessing the detailed interior. Drive the happy passengers to the station. Raise the barriers to cross the track. Grab a newspaper and relax with a warm espresso from the cozy coffee shop. Man the ticket booth, serve the travelers and slide the tickets under the serving window. Accessories elements include buildable wreaths and wrapped gifts, plus 2 mugs, ticket, newspaper and an envelope. Special elements include new-for-October-2017 1×1 round plate with horizontal shaft, 4×6 roof element in dark blue, gray microphone element, printed ticket element and shield elements with printed clock-faces. Includes 4 straight track pieces to connect with the LEGO® Creator Expert 10254 Winter Holiday Train. Winter Village Station measures over 7 (19cm) high, 11 (28cm) wide and 5 (14cm) deep. Grade Crossing when closed measures over 2 (6cm) high, 5 (13cm) wide and 5 (14cm) deep. Bus measures over 3 (9cm) high, 5 (15cm) long and 2 (7cm) wide. 10263 : Winter Village Fire Station. This delightful LEGO set features a 2-level, holly-adorned building with an upper-level kitchen, complete with a red telephone, table, fold-down bed and a LEGO light brick. Behind the large red fire station doors, you’ll discover firefighting equipment and a fire pole, while outside there’s an ice rink with a decorative firefighter statue, a decorated Christmas tree with transparent star and gifts, plus a bench and lamppost. 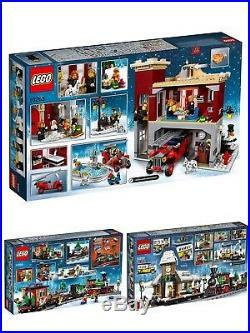 Includes 6 minifigures: 3 firefighters, ice hockey player, musician with saxophone and a girl with a scarf, plus a Dalmatian figure, brick-built snowman and a baby figure with a moose sweater. 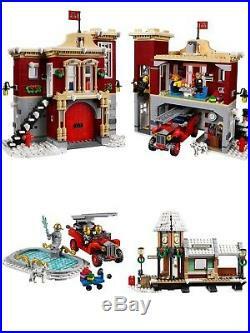 The 2-level Winter Village Fire Station comes with an array of brick-built details, including a detailed facade with decorative columns, ornate windows, large red garage doors and holly decorations, plus an ice skating rink with firefighter statue, decorated Christmas tree with transparent star, sleigh, bench, lamppost and a LEGO® light brick. Also includes a classic red fire truck with a turntable ladder, hoses, toolbox and deep-tread tires. Ground level features a garage area with a fire pole and firefighting equipment. Upper level interior features a cozy kitchen with red telephone, coffee maker, dining table, radio, dog bed and a fold down bed for a firefighter. Raise the fire truck ladder and help the firefighters decorate the tree. Build a cute snowman with a cool top hat. Accessory elements include ice skates, a hockey stick, gold-colored helmets, saxophone, hot dog and bun, dog bone, toolbox and tools. Fire Station measures over 9 (23cm) high, 9 (25cm) wide and 5 (14cm) deep. Fire truck measures over 2 (6cm) high, 1 (4cm) wide and 5 (13cm) deep. Please not the following. 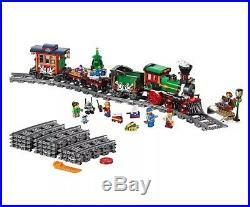 The item “New LEGO Xmas Creator Sets 10254 Holiday Train + 10259 Station + 10263 Fire Stn” is in sale since Thursday, November 8, 2018. This item is in the category “Toys & Hobbies\Building Toys\LEGO Building Toys\LEGO Complete Sets & Packs”. The seller is “gala.inc” and is located in Walnut Creek, California. This item can be shipped worldwide. Post filed under lego and tagged creator, fire, holiday, lego, sets, station, train, xmas.